FBU has called a demo outside emergency LFEPA meeting on Monday 11th February at 12.30, Brigade HQ, Union St SE1. Say NO to Boris Johnson’s cuts. 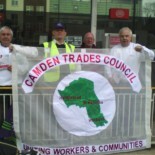 This entry was posted on February 7, 2013 by CAMDEN TRADES COUNCIL.